Azerbaijan stands for intensive talks to move forward peace talks on Armenia-Azerbaijan Nagorno-Karabakh conflict, Azerbaijani Foreign Ministry’s Spokesperson Hikmat Hajiyev told reporters, commenting on the controversial reaction of Armenians to today's speech by Azerbaijani President Ilham Aliyev. "As a result of political crisis when change of government happened in Armenia Azerbaijani side stated that if sober minded politicians came to power then progress in resolution of conflict was possible. However, it seems that new oсhlocracy regime of Armenia tempts to repeat faults of previous regime?! Against the background of OSCE Minsk Group Co-chairs statement and comments of Azerbaijan's Foreign Minister after Paris meeting MFA of Armenia continues to demonstrate old style destructive position. 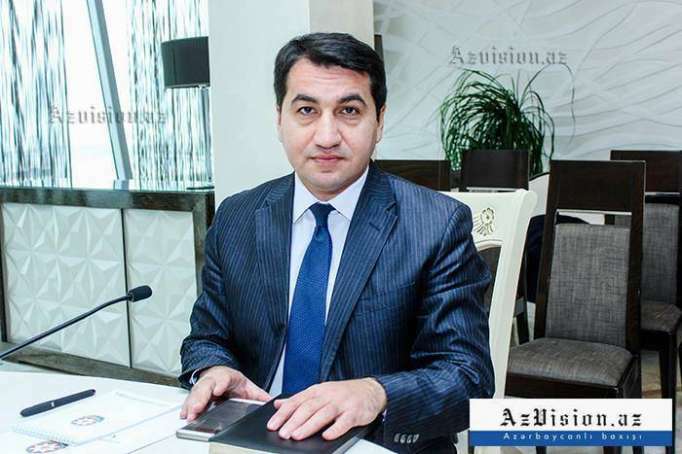 If press secretary of MFA Armenia who is remnant of Sargysian's regime makes such futile statements with the instruction of new Foreign Minister then assuredly same fate expects new regime of Armenia", Hajiyev said. Ministry’s Spokesperson added, that bringing unrealistic new elements can only paralyze the entire negotiations. "Very soon we will see which path is chosen by Armenia. But everyone must know that Azerbaijan's patience has its limits."